There is an apocryphal story that in the 1980s, when my High School was built, they were offered a million dollar choice by the Board of Education. The school was to receive $1,000,000 earmarked for one of two options: either the school could finance a football team, or they could landscape the entire property for decades to come. The two towering maple trees in the school’s atrium attest to their choice. As a result, I’ve never really been acquainted with the institution of cheerleading. Lacking a football team at school, we had no cheerleaders. My university’s mascot – the Yeoman – didn’t really lend itself to a popular cadre of cheerleaders (though York’s women’s sports teams were somehow referred to as “yeowomen”). And they are (thankfully) mostly absent from professional hockey. That said, I’ve recently been introduced to a new type of cheerleader. This is particularly fortuitous given the upcoming Super Bowl. As the lone Canadian at my school in Jerusalem, I have needed to brush up on some NFL particulars. Thanks to Canadian Prime Minister Stephen Harper, I’m now up to date on what it means to be a cheerleader. Harper’s recent visit to Israel has been something of an anomaly to me. With US Secretary of State John Kerry conducting monthly shuttle diplomacy here, the US-brokered nuclear talks in Iran, and a daily focus on America’s lack of involvement in the situations in Syria and Egypt, it has been a largely American-centric year here in foreign affairs news. 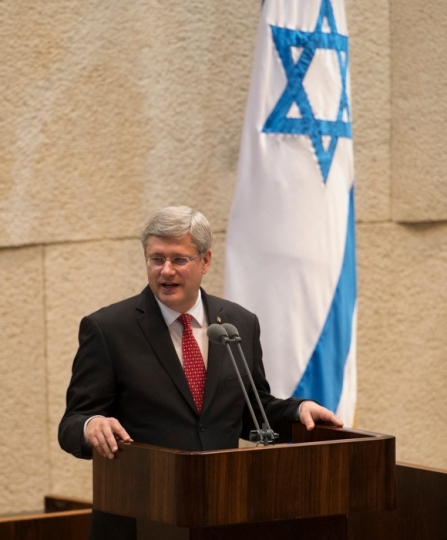 But Harper’s speech before the Knesset, along with the messaging of his entire trip was largely nothing new. It lacked nuance, gave scant attention to Israeli-Palestinian relations, did nothing to advance Canada’s role as an international peace broker, and left little room for growth in this international relationship. Harper wanted Israel and the entire world to know how much Canada loves Israel, how we’re the best of friends, and how nothing can tear us asunder. Yes, it was nice to hear about the deeply ingrained mutual respect our countries have for each other. Yes, it was wonderful to hear Israel spoken of in such a positive light from a foreign dignitary. Yes, it was exciting to hear my home and native land spoken of so highly from abroad. The Israeli press ate up the entire week-long spectacle, with Harper repeatedly gracing the front-pages of Israeli dailies. People were fawning over Canada. As the token Canadian amongst my circles, I suddenly became the expert on all-things Canada. But something was missing. Depth. Nuance. Relevance. [It] leaves no room for nuance, balance or understanding of complexity, just a dualistic clash between good and evil, progress and darkness, stability and danger. Of course, this is not how other Western countries behave in the Middle East, including those who strongly support Israel. But it is now Canada’s way. That said, there is room for someone who has this paradigm. There is a place for this type of player on the international stage. We need look no further than the upcoming Super Bowl for the model of this figure par excellence: The Cheerleader. The entire worldview of the cheerleader is limited to two and only two potential outcomes: a win or a loss. What cheerleaders want most of all – more than dialogue, more than depth, more than nuance, more than constructive discussion, more than engaging international activism – is for their side to win. Yes, there is a role for the cheerleader, but it is not one of great substance. Harper’s Mideast is a football game, with Canada newly enshrined as Israel’s cheerleader, jumping around wildly on the sidelines. Yes, there is certainly a role for the cheerleader, but it is confined to the sidelines. Harper offered no substantial commentary on the main issues confronting Israeli society today that Canada might play a role in. Little of consequence was said about the Israeli-Palestinian conflict, the African refugee crisis in Israel, matters of religious pluralism, or environmental crises facing the country. With all due respect to the Prime Minister of Canada, his relevance in the international community, his influence on what goes on in the Middle East and his ability to help Israel in matters of life and death are inversely related to the size of his country. 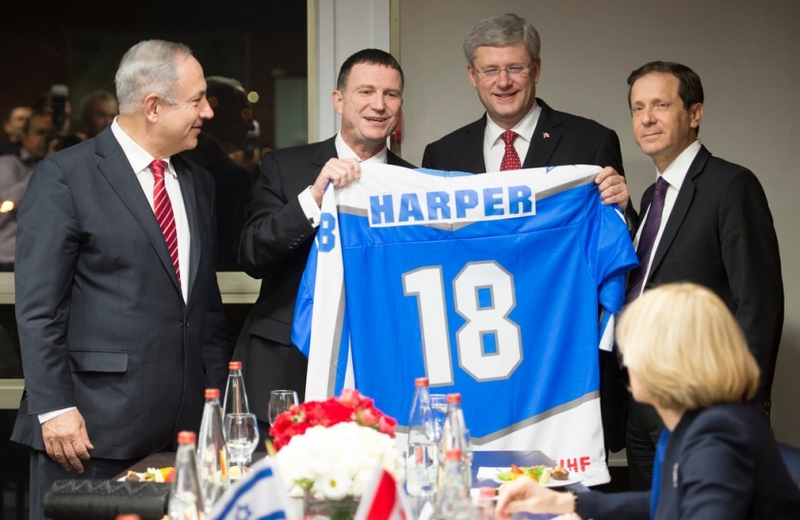 Harper’s love for Israel may come from the depths of his gut. It may be a very real and true part of his identity and what he wants Canada to reflect. But in viewing Israel and the Middle East as a football match, with a zero-sum outcome of a win vs. a loss, Harper has overestimated Canada’s role. We are not the Quarter Back. We are no longer the internationally respected honest brokers of peace. Instead, Canada is dancing wildly from the sidelines, cheering and screaming, yet somehow inexplicably feeling as though we’re contributing to the outcome of the game. Stephen Harper seems to have forgotten that cheerleaders don’t get to win the Super Bowl. Hi,I log on to your blog named “Stephen Harper’s Canada: Israel’s Cheerleader – Jesse E. Paikin…” like every week.Your writing style is awesome, keep up the good work! And you can look our website about proxy list daily.